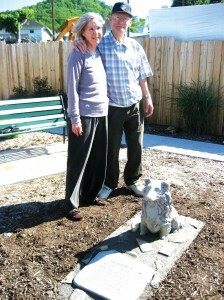 Charlie Vanhuss struggled to hold back the tears last week as he helped to dedicate a statue of his beloved late dog “Lassie,” placed in the Charlie VanHuss Park next to city hall in Ravenna. “She was a devoted friend and loving companion. I miss her,” he said. Lassie was nearly 18 years old when she and Charlie went for one of their regular daily walks last summer. Charlie said it was hot and maybe they walked a little farther than they usually do. He stopped to talk to a neighbor and Lassie went on around to the back of Charlie’s house on Elm Street. Charlie said Lassie performed one more act of love as he was taking her to the animal shelter at Cow Creek. Perhaps, not surprisingly, Ravenna Town Clerk Kim Parks reports that her new Sheltie puppy, Penny, is very partial to Charlie.